William (“Dr. Bill”) Silvers, MD, encourages his patients to live life to the fullest. “Asthma should not hold anyone back from aspiring to be an Olympian,” he affirms. A dedicated board-certified allergist for 37 years, Dr. Silvers started the donor-advised Allergy and Asthma Health Fund at Rose Community Foundation to create a legacy focused on medicine and Jewish values. He established his fund as a promise for the future and an opportunity to contribute to his community. 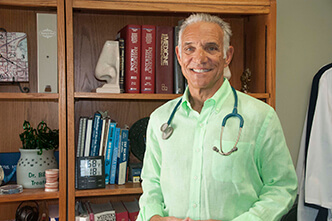 Here, Dr. Silvers answers questions about his experience. How did you become acquainted with Rose Community Foundation? Though I have been aware of Rose Community Foundation since the hospital’s transition [the Foundation was founded in 1995 following the sale of Rose Medical Center], my personal engagement began when I met [the Foundation’s director of philanthropic services]. After learning more about the Foundation’s mission, I decided to transition some monies into the Allergy and Asthma Health Fund, and I continue to invest each year. What’s your personal passion in terms of philanthropy? My personal passion is to leave a legacy where medicine and Jewish values intersect. This fund allows me to work with Foundation leadership to determine the best place for those monies to make a difference in Denver and the Greater Colorado community. Why did you choose to work with the Foundation? Rose Community Foundation seeks to make the world a better place for the next generation. The concept of “tikkun olam” (meaning “to repair the world”) is central to the Jewish people and to each individual Jew. And we’re part of the Colorado community, so we participate. The Foundation walks that balance very well. I am involved with the Allied Jewish Federation of Colorado, Maimonides Society, state and national Allergy and Asthma Society. Most importantly, perhaps, would be the time I spend right here in my office caring for our patients. I also believe in helping on a more expansive scale through special events like Asthma Ski Day and Allergists for Israel. What has your experience been with Rose Community Foundation? Starting with Jewish values, Rose Community Foundation offers a breadth of vision and exemplary stewardship of the monies we wish to give. I trust the professionals at Rose; they take their jobs as capable stewards of one’s monies and one’s wishes for the community very seriously. Are you interested in exploring your options for opening a fund at Rose Community Foundation? Learn more about our philanthropic services.